Tea processing :Fixed -Rolled -Pile -fermented -Dried(oxidized by the oxidases of resident microbes) Dark Tea only exists in China and is an indispensable beverage for the Chinese ethnic minorities in their everyday life. Unlike most types of Chinese Tea that's taste and aroma fade with age, Dark Tea actually improves with age, making it a favorite with collectors and investors. This is a Chinese specialty and is sometimes referred to as dark tea. There are a few different provinces, each with a few regions, producing dark teas of different varieties. Those produced in Yunnan are generally named Pu'er, referring to the name of Pu'er county which used to be a trading post for dark tea during imperial China. 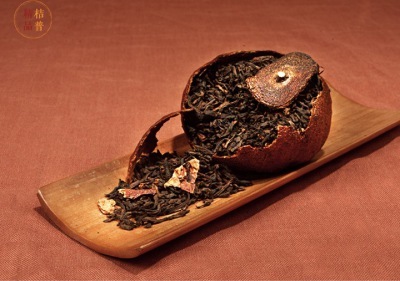 Pu'er is available as loose leaf or in various compressed forms. There is also the differentiation of raw (green,生shoeing) and ripened (cooked 熟shot) types. The show type refers to those varieties that have gone through a proper post-fermentation process,while the shoeing types are those in the process of gradual darkening through exposure to the environmental elements. Certain selections from either type can be stored for maturity before consumption.That is why some are labelled with year and region of production. All types of pu'er tea are created from máochá (毛茶), a mostly unoxidized green tea processed from a "large leaf" variety of Camellia sinensis found in the mountains of southern Yunnan. 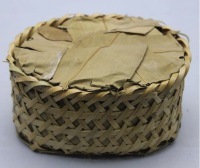 Maocha can undergo ripening for several months prior to being compressed to produce ripened pu'er (also commonly known as cooked pu'er), or be directly compressed to produce raw pu'er. - added processes: green and dark pu'er can be compress/shaped into cakes and aged. 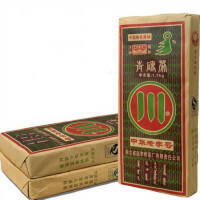 Ripe pu'er (熟普) is produced in the same way as raw (青普), but with the addition step of wet piling (渥堆), a process similar to composting, just after fixation, prior to being dried. A round, flat, disc or puck-shaped tea, the size ranges from as small as 100g to as large as 5 kg or more, with 357g, 400g, and 500g being the most common. A convex knob-shaped tea, its size ranges from 3g to 3 kg or more, with 100g, 250g and 500g being the most common. Its shape is similar to tuóchá, but larger in size, with a much thicker body decorated with pumpkin-like stripes. 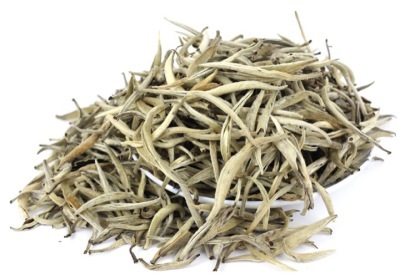 moonlight white tea is new created tea, its name mainly from the production method.This tea is a kind of puer tea that adopts special production process. Its blade surface is black while the blade back is white, black alternating with white. The pekoes of the buds and leaves revealed white just like a crescent moon. And the bud with the two leaves whole looks just like the moon in night, so it named” White Moonlight”Another way of talking is: the roughcast of every batch of tea must be finished within a day.This tea was picked its tender buds as material under the moonlight in night, and it can’t see the sun from its recovery to its process complete. It can only dry under the moonlight and this tea was only picked by the local beautiful young girls, and thus it got the name as” Moonlight Beauty”. Moonlight Beauty, it is a kind of puer tea, and it is mainly produced in Simao region of Yunnan Province.White Moonlight Tea was a royal tribute tea which was selected from many famous teas and it also got the name as queen’s tea. n addition the Moonlight Beauty has the value of health care, appreciation and collection. The Pu'er brick tea with Citrus is originally from Huizhou Tea, Xinhui, GuangDong Province. Xinhui Citrus, the peel of the red orange is the well-known specialty of XinHui – Citrus. Because of its high food value, it also share the traditional spices and seasonings, so it has a high reputation. 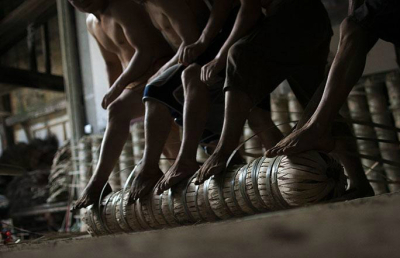 As early as the Song Dynasty, it has been one of the “ canton goods” in the North-South trade. During Tongzhi Period, Qing Dynasty, the Citrus becomes a tribute, and the Empress Dowager Cixi regards XinHui Citrus as the tribute., so there are such reputations 『Millennium Ginseng, Century Citrus』 and 『Century Citrus wins gold 』. For Citrus, the long time it was kept, the better, That’s why we call Citrus. . And among these, the citrus produced in Guangdong is the best one. During the old trade history, it was called “Canton Citrus”, which is different with the other province. And XinHui Citrus is the best among Canton Citrus. Pu'er brick tea with citrus——the use of the Xinhui Citrus and Yunnan Pu'er which make a perfect combination. With the nice smell of the Xinhui Citrus, the sweet of Puer, the long time you keep, the better, also, only use a little tea, you can enjoy a long time. Usually drink this tea, not only sweet, but also good for your appetites. Also because the XinHui Citrus with good flavor which make it become the best. And after combine XinHui Citrus and Yunnan Puer together, it becomes more valuable and it is the best choice for collection, gift and the daily drinking. The dark tea drunk be Tibetans, also known as Tibetan tea, is a unique dark tea that comes from Sichuan’s Yaan. The place was the first stop over the Ancient Tea-Horse Road, to carry Yaan’s tea to Lijiang in Yunnan, Kangding in Xikang, and even further to India. Wrapped in cloth sack and kept in bamboo holders, the compressed tea bricks were once used as currency to trade horses and other things. The ancient technique of making Tibetan tea is still kept alive in a number of time-honored tea factories in Yaan as a national-level intangible cultural heritage. Compared with Yunan’s Pu’er tea, Tibetan dark tea is much less known to the rest of China, let alone the international market. Liu Bao Tea is from Guangxi province, south west of China. In Qing dynasty, Liu Boa Tea was listed as one of the famous tea during years of JiaQing emperor. Named under the original producing town Guangxi Wuzhou Liubao village. Liu Bao Tea is a famous tea in the history. It's production history can be traced back to one thousand five hundred years ago. Liu Bao tea leaf picking a bud and two, the beginning of the system by sharing green, low-temperature fixing, rolling, and steep heap, dry made. Replication process, including screening shaping, pick stems pick films, fight heap, cold fermentation, drying, steaming on, step baskets, and cool set aging. 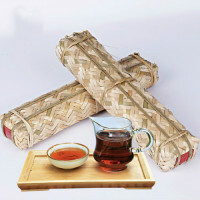 The finished product of Liu Pao Tea has various kinds of package styles such as bamboo basket, cloth basket and so on. The technology of dark tea has two notable characteristic in the processing of Hunan dark tea: Pile-Fermenting and Fire-Drying with pine wood during primary processing. Without these two processes, It can't be called “Dark Tea”. Black glossy, dark brown, stale and mellow, a little pine odor is the characteristic of dark tea. The earliest record about “dark tea “appeared in Chinese history in 1524, in which the real dark tea originated in Anhua of Hunan. Hunan was the main producing area of dark tea during the Ming Dynasty, the production of tea in Anhua, Linxiang was the largest, and the quality was excel. As one specification of dark tea, Poria Cocos Brick (Fu Tea) is the top grade in the ancient kind of Dark tea. Being complete ferment tea, Poria Cocos Brick Tea is the most complex and unique brown tea which has the longest production processing cycle. It products Aspergillus Cristatus, brick-like in appearance, with flourishing golden flowers all over, dark and shining, red and strong tea soup, mellow to the taste with lasting scent. “Peoria Cocos Brick Tea contains the many kinds of amino acids, the Vitamin and the trace elements which the human body needs, and its rich inclusion can effectively block the formation of carcinogenic micros group compound in human body. The contained steatolysis enzyme has the decomposition to be greasy, the digestion and reduces human body function as well as fat compound, cholesterol, three acid anhydride fat. 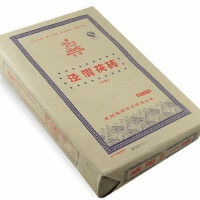 Qianliang tea was dried by putting in sun and opening in dark, it may be said “absorbing the elite of the nature”. The season of stamping and making the tea is very strict, or it is easy to become mildewed or burn in the heart. Qianliang tea stored for many years, has been filled with tea worms on the surface of it. Tea worms and their excrement not only can't damage the quality, but also make the pharmacologic efficacy more remarkable. There are many ways to drink dark tea: pure-drinking can make you taste the real quality of tea, flavored-drinking can make you not only enjoy the prefect combination of tea and milk, but also supplement the nutrients from drinking tea, medical-drinking can relieve the diseases of human body. So the people may make choice according to their own habits and health conditions. Third Step: Heating tea pot to boiled water, the tea liquid color may change quickly. Fourth Step: Pour out the tea liquid from the tea pot. Please filter the tea leaf. Fifth Step: Enjoy the Dark tea. We could add water and heat again until the tea liquid color become light. Six Step: some people like drink cool Dark tea liquid, they believe that is much nice than hot liquid with pure natural sweet flavor. The main functional composition of dark tea is tea polysaccharides compound. This kind of compound is regarded in medical science circle that it can adjust sugar metabolism (prevent and cure diabetes) ,reduce blood fat and high blood pressure, resist thrombasis and improve immunity of human body. 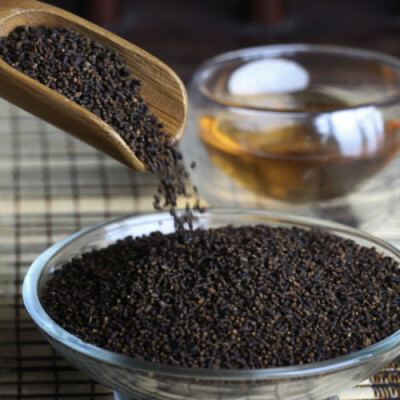 Pile-fermenting of dark tea can make the big-molecular compounds in tea decompose and fission, and secrete the small-molecular compounds helpful to the quality of tea through the metabolism of itself under the participation of useful microbes, such as Candida, Aspergillus niger and bacteria, etc., and make tea taste coordinated and liquor color deep etc. Drying dark tea by smoke-baking with pine wood can further improve the quality of tea, and make tea products high in aroma, mellow in taste and deep red in liquor color.Hunan dark tea has unique quality and remarkable pharmacological effects, this is because the processing of dark tea is different from that of other kinds of tea, among which pile-fermenting is the foundation of quality formation of dark tea, and smoke-baking with pine wood further promotes the formation of color, aroma and taste of dark tea products. 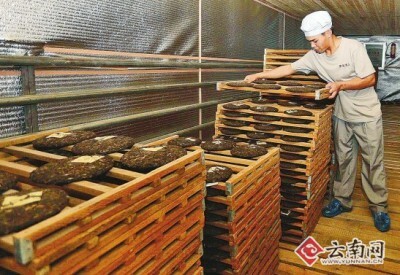 The process of fungus-growing of Fu brick tea is the characteristic technique distinguished from other dark tea, which can not only improve the color, aroma and taste of the tea products, but also make them produce magical medical efficacy, so Fu brick tea is generally acknowledged as “The mysterious Tea on the Ancient silk Road of China”, and widely concerned in tea and medical sciences circles all over the world. Reference amount: Tea 0.5g by adding water 300ml. Specific should be added according to personal taste slightly.Put proper amount of tea into the prepared glass with boiling water over 90 C degrees, and cover the lid.Along with the sinking of the insect tea, strips of sanguine threads release, as if red dragons rove over the sea. However, when the sorrel tea mixes with water, there are milky flocs appearing in the glass, like white lotus flowers blossoming in the water. 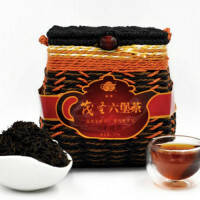 Processed from Laoqing Dark Tea, it’s mainly sold to Mongolia and Russia.